Banjarmasin, 9 June 2016 – Archipelago International is furthering its presence in Baniarmasin with the opening of favehotel Banjarbaru – Banjarmasin. It will be the second favehotel to open in South Kalimantan, presenting a perfect choice for both business and leisure travelers seeking an affordable yet professionally managed hotel. Banjarbaru is the gateway for tourists visiting South Kalimantan via Syamsudin Noor Airport. With a perfect location, favehotel Banjarbaru is easily accessible just 15 minutes from the airport, and very close to government offices and the administration center. This new hotel is also close to Martapura city, the focal point of the diamond industry, as well as the foremost diamond cutting venue and producer of top quality jewelry. Introducing a stylish and uniquely designed hotel to the area, favehotel Banjarbaru features 119 well-appointed rooms that range from superior to suite rooms, with 32” LED TVs, top of line beds, en-suite bathrooms with showers, and fast and reliable complimentary WiFi throughout the hotel. favehotel Banjarbaru also offers a swimming pool, optional laundry services, in-room massages and ample parking space. The hotel also provides 5 meeting rooms that can accommodate up to 150 delegates for all business needs, completed by a coffee shop that serves various traditional and Western cuisine. 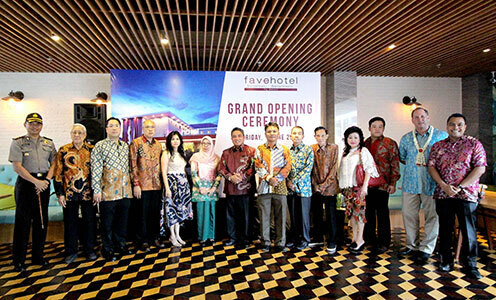 favehotel Banjarbaru will therefore become a value hotel with a fun atmosphere, complete with the signature favehotel design and friendly concept, surrounded by natural greenery for a relaxing ambiance. “favehotel Banjarbaru – Banjarmasin is a budget hotel with complete amenities. With its homey setup, the hotel creates a relaxing and comfortable ambiance for our guests throughout their stay. With our friendly and personalized service, we believe that favehotel Banjarbaru – Banjarmasin will become a favorite hotel in Banjarbaru," said Winston Hanes - Director of Operations of Archipelago International.